Kathleen Rose Winter, 51, passed away on May 4, 2008. A lifelong Chicagoan, Winter was active in several fields of pursuit including advocating for the rights of people with disabilities, athletics, writing, performing, and public speaking. Winter lived with the disability, osteogenesis imperfecta, commonly known as brittle bone disease; however, her fierce spirit never was daunted by the condition. In 1997, Winter prevailed in a $50,000 judgment with the City's Commission on Human Relations when she sued the Chicago Park District for wheelchair inaccessible restroom stalls at the Lincoln Park Conservatory. Winter received a masters in psychology from Roosevelt University. Winter graduated from Spalding High School, and earned a bachelor's degree from University of Illinois at Chicago. Winter's professional career included employment at Access Living, a Center for Independent Living for People with Disabilities, and the Mayor's Office for People with Disabilities. She was also a substitute teacher, and had once even been a cab driver. Winter was nationally ranked and a Paralympic competitor in several sports over the years including track and field ( javelin, shot put, and discus ) , fencing ( épée and foil ) , and powerlifting. Winter's last public athletic appearance was at Gay Games, VII in 2006 in Chicago, where she received a gold medal for 30kg powerlifting. Winter also competed on a national level in wheelchair fencing being ranked 4th in épée and 5th in foil at the 1996 National Championships. 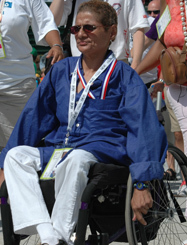 Winter also participated in the 1999 National Sports Festival for the Disabled. She participated in the 1998 Dubai, United Arab Emirates, 2nd world power lifting championship. In 1992, at the Barcelona Paralympics she competed in track and field. Winter was a member of the 1996 U.S. Paralympic Team and competed in the Atlanta games. Her final Paralympics appearance was the Sydney 2000 games in powerlifting. Winter served on the board of the Disability Arts and Culture Center. She appeared in the locally produced musical the Plucky and Spunky show, written by Chicago writers Susan Nussbaum and Mike Erving, which spoofed mainstream views of people with disabilities. She was also a steering committee member of Chicago Black Lesbians and Gays. Her writings were among those performed by the Black LBGT Theatre troupe, A Real Read. Winter was a frequent contributor to BLACKlines, Outlines, and the Windy City Times. In the Windy City Times she authored a column, Tales from the Crypt, where she explored her bi-racial African American and Armenian identity, along with other intersections identity including disability and sexual orientation. In her last years she aspired to be a stand-up comic and frequented the local amateur comic circuit. Winter was born on Sept. 10, 1956 to Clifford Obanion and Caroline Winter who both predeceased her. She is survived by her spouse, Elandria Henderson, and her brothers Delano Obanion ( Chicago ) , and Michael Winter ( Washington, D.C. ) , and by her uncle and his spouse George and Margaret Terzian. She is also survived by her god children Ricky, and Luis Balfred, and Regina Riggs and their mother Elena Riggs. PICTURE: Winter at the Gay Games VII Closing Ceremonies in Chicago, 2006. Photo by Kat Fitzgerald.